Mobile landing page optimizations are performed to better convert clicks to conversions from mobile ads. Optimizations serve as testing that allows advertisers to discover what works best, driving more conversions and increasing return on investment. Advertisers displaying ads on mobile devices must create mobile-friendly landing pages and optimize them consistently to increase their conversions further. Advertisers should look to their landing page data and analytics to make insightful optimizations strategically. This can be a challenge for those who don’t have landing page or data analysis expertise. However, with the help of sophisticated optimization tools like Freshmarketer, it is easy for anyone to build professional-quality mobile landing pages and make informed optimizations. Optimizing mobile landing pages is the only way to get real data on what works and what doesn’t. As the advertiser and the creator of the mobile landing page, it can feel evident what is good and what isn’t, but it is often surprising to see what actually works to increase conversions. Optimizing will also help increase your ad’s quality score, leading to better ad rank and placement, lower costs-per-click (CPCs) and more clicks out of your same ad spend. Landing pages are simple in nature. However, mobile landing pages are extremely simple. Because mobile screens have limited real estate in terms of available screen space, they use a limited amount of text and visuals. This can make mobile landing pages sound elementary. However, having such a small amount of space is often more difficult as your landing page’s messaging needs to be just as strong but with less text. Mobile landing page optimizations will be made on the platform where the page was built. This may be WordPress for those who know how to code or an easy-to-use landing page builder like Leadpages or Instapage. From there, you will create a duplicate version of your existing landing page. To find which area of the landing page has the most room for improvement, review your landing page data from your advertising platform, Google Analytics or tools like Mixpanel. Once you have found the aspects of the landing page data that need help, change one part of your mobile landing page that correlates to that area of improvement. For example, if you’re not seeing conversions, consider whether your call-to-action (CTA) button appears on the screen without requiring the user to scroll down, whether your offer is strong enough or if you are using a contact form that requires the user to input the right number of fields. Example of mobile search and mobile landing page. Businesses advertising on mobile need to have mobile landing pages as well as ways to monitor, analyze and optimize them. In general, landing pages should be optimized for improved performance, but also mobile devices change more frequently than desktops, so it’s important that mobile landing pages are kept up to date. It’s also worth noting that mobile suits certain businesses better than others, so consider if mobile is right for you. Every business utilizing pay-per-click (PPC) advertising should optimize their landing pages no matter which device the landing page is designed for. If you’re also optimizing landing pages for desktop devices, it is worth checking out our general article on landing page optimizations. If you’ve been using the same landing page for a while and have collected data to pull insights, you’re ready to start optimizing your landing page for more conversions. 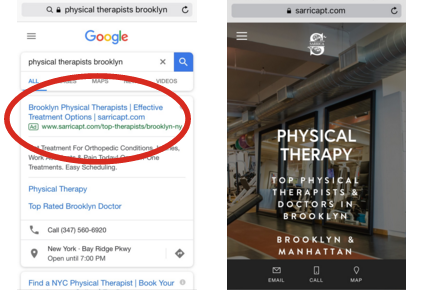 First, confirm your landing page is mobile-friendly. Next, review your key performance indicators (KPIs) to choose one element to optimize, and then A/B test the new landing page against the old. Get strategic about your optimizations by following our step-by-step guide to optimizing your mobile landing page. Optimize your mobile landing page in six simple steps. First, confirm that the landing page you are optimizing is mobile-friendly. Mobile landing pages work differently from desktop, so be sure that your mobile landing page is in a single-column layout, responsive and uses a smart mobile CTA. With these elements, you still need to remember that your landing page needs to coincide with the ad it is linked to, and maintain your messaging across your ad and your landing page. Here are the main elements of a mobile landing page. Mobile landing pages must be in a single column layout. 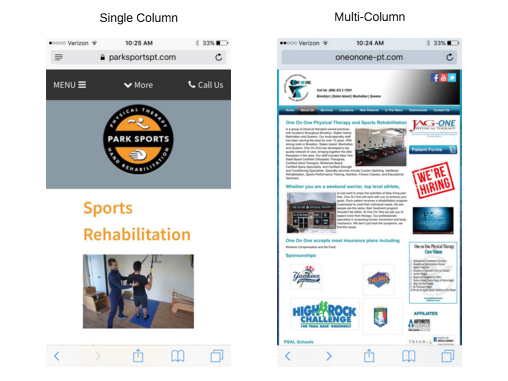 Standard websites utilize more than one column, but mobile is so condensed that in order to be legible without zooming in, the landing page should be a clean one column. Single vs. multicolumn mobile webpage. A responsive webpage is one that adjusts its size and image ratio automatically to fit any device. This is crucial with mobile landing pages as mobile screen sizes are variable with different image ratios. If your landing page isn’t responsive, then it’s likely not to display correctly on different mobile devices. 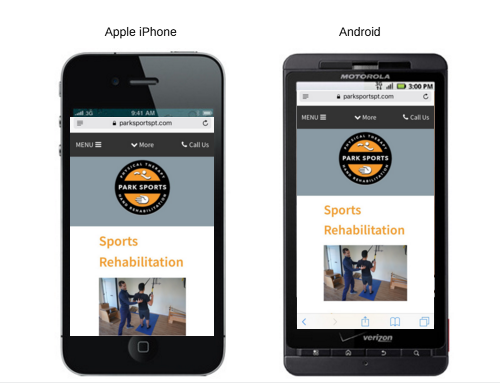 Responsive mobile landing page example on Apple and Android. 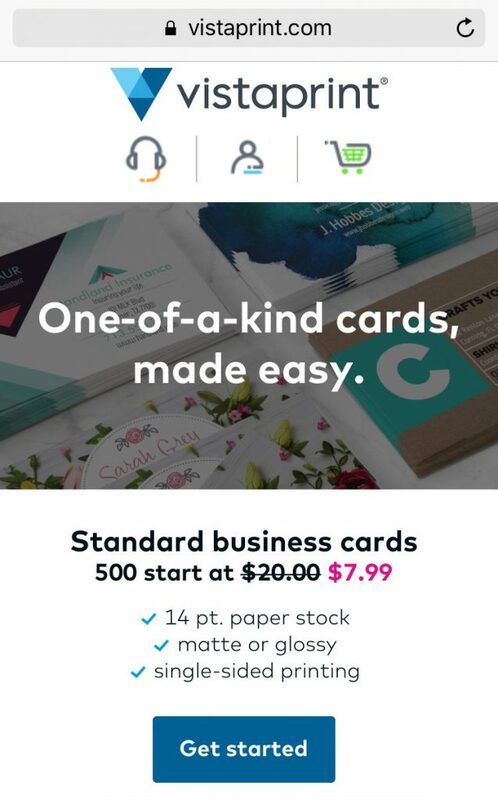 Mobile landing pages have unique CTA capabilities. Despite the fact that phones feel like minicomputers, they have different functions and can allow users to make a call easily or get directions using GPS. Advertisers can be smart about using CTAs that serve their target audience to give them the opportunity to take action precisely. 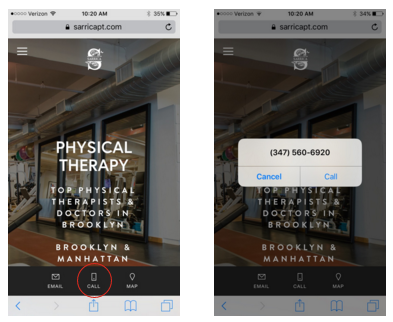 Example of a click-to-call mobile landing page. Looking at your KPIs, such as the number of conversions and conversion rate, you can discover areas that could use the most improvement. Optimize those areas in order to improve your landing page, and use this process to find new areas for optimization continually. Here are some steps to take your analysis. Conversions are the number of times a user takes a designated action on your site, such as your CTA. For example, if a user clicked an ad to book a hair appointment at a hair salon, and then actually booked an appointment from the landing page, that is a conversion. Conversions are your ultimate goal as they are what turn a hard-earned click into a lead, so your number of conversions and conversion rate are your primary landing page KPIs. Conversion rates indicate the percentage of users who converted on your page, revealing the percent of how many visited and took no action. Don’t overlook your conversion rate as it can be indicative of your landing page’s performance. A high conversion rate tells you that your landing page is very effective. However, a landing page could have a high conversion rate with a smaller number of conversions if the ad the landing page is linked to gets fewer clicks. For perspective, the average conversion rate across all industries is 2.35 percent and varies to over 24 percent for top-performing accounts. A 5 percent conversion rate, for example, would mean five users convert on your page for every 100 visitors. Average landing page conversion rates (Source: WordStream). To create effective ad copy, consider the reasons why users decided to click on your ad and how you can best deliver that to them. Using that message, now condense it for mobile by reducing the amount of text on the landing page, limiting the contact form fields to reduce landing page clutter and making sure to back it with a mobile-friendly CTA. Here are some ideas for optimal landing page copy. Writing ad copy for mobile landing pages is a challenge, as mobile devices are extremely limited on space, giving you very little room to emit your message clearly. If your offer and CTA are strong enough, your headline will only serve as a brief reminder to users as to why they’ve arrived at your landing page and what they came there for. All types of landing pages should use the fewest contact form fields as possible; adding fields gives users more information to input and, therefore, reduces the chances that they will convert. This holds especially true on mobile given the lack of space for contact forms. It’s ideal to use a CTA button in lieu of a contact form on mobile landing pages to provide users with what they came to your landing page for more quickly. You shouldn’t use an offer on mobile that a user can’t use on a mobile device. For example, many advertisers use free ebooks and downloads as their offer. However, it is unlikely that a mobile user will want to read an ebook or download a document to their mobile device. Make sure your landing page has both form and function with great design to support your ad copy. When reviewing mobile landing page design, keep user experience in mind. You’ll want to be sure that your landing page is user-friendly with easy navigation and has easy-to-use contact forms and CTAs that display without scrolling as well as simple images for a clean aesthetic. User experience is crucial in the effectiveness of an ad. If it is difficult to navigate or click your CTA, then no one will convert on-page. Mobile devices are more difficult to design for usability because they are not only small but touchscreen as well. For example, a button that is placed too close to another button or link may be hard to click on mobile, whereas on a desktop a user is using a mouse or trackpad making the spatial difference larger. A common mistake advertisers make with mobile landing pages is that they often get consumed by sharing their landing pages message and spend too much time on that before getting to the CTA. A user shouldn’t have to scroll down on your page to complete your CTA. Just like a landing page for desktop devices, a mobile landing page CTA should be above the fold in that it does not require the user to scroll down to find it. Use images that are clear, straightforward and don’t muddy your message. Small screens mean it’s easy for an image to make your landing page feel cluttered and busy, which can be distracting and lead to fewer conversions. Test your mobile landing page’s load time by doing a free and easy speed test. If your page is slow, it may indicate things like that you are using too many plug-ins, are on a server that is far away or potentially overloaded or that your image is too large. 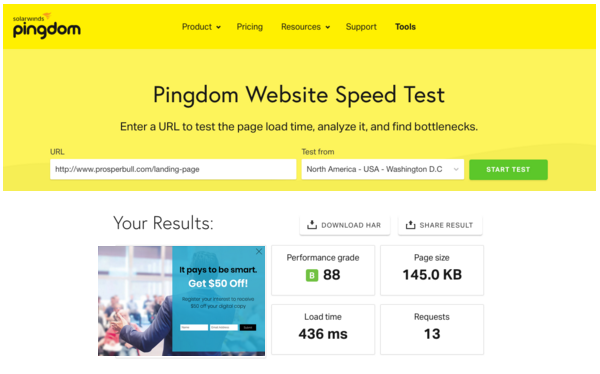 Test your landing page speed for free by visiting Pingdom. 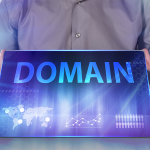 From there, go ahead and copy and paste your landing page URL and click the green button. Pingdom will test your landing page speed and, when it’s finished, you will receive a short report on how well your landing page performed. This information will tell you whether or not your landing page is up to speed and potential reasons why it might not be. Example of a free website speed test. Split testing is when you use both your new and existing landing page with the same ad to test which performs better. Running the two concurrently is the only accurate way to determine whether your update made a positive impact on your conversions and conversion rate. To do this, duplicate the ad that this landing page was designed for. Then, update the duplicate with the new landing page. Let them collect data, then review data to determine which is better. 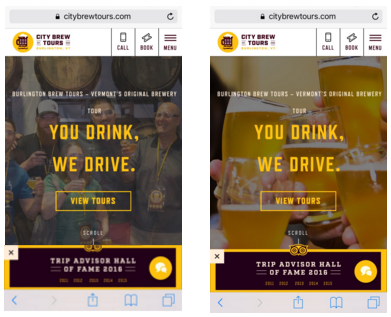 Example of split testing mobile landing pages. Mobile landing page optimization tools allow you to make strategic and informed optimizations easily. There are many different types of optimization tools available, and new ones are always popping up. When choosing which to use, start with tools that help you in areas you struggle with the most. For example, you may find Google Analytics a challenge to understand, so using a platform like Mixpanel will make that much easier. Landing page integration tools: Use Leadpages to integrate other platforms you’re already using into your landing page like such as Mailchimp and HubSpot CRM. Learn more about Leadpages to find out if its right for your business. If you’re looking to create a mobile landing page or make mobile landing page optimizations and need some tips and inspiration, check out some great mobile landing page examples. These will give you an idea of how to apply mobile landing page optimizations in terms of design, functionality and content. Your landing page should clearly provide the user with exactly what they clicked on your ad for. For example, a user searched for local pizza delivery, saw an ad for Seamless, clicked it and landed on the page below. This mobile landing page gives the user the ability to find exactly what they were looking for when they clicked the ad. Mobile landing page example 1. Make your CTA powerful by using actionable language that yields the result they’re looking for. 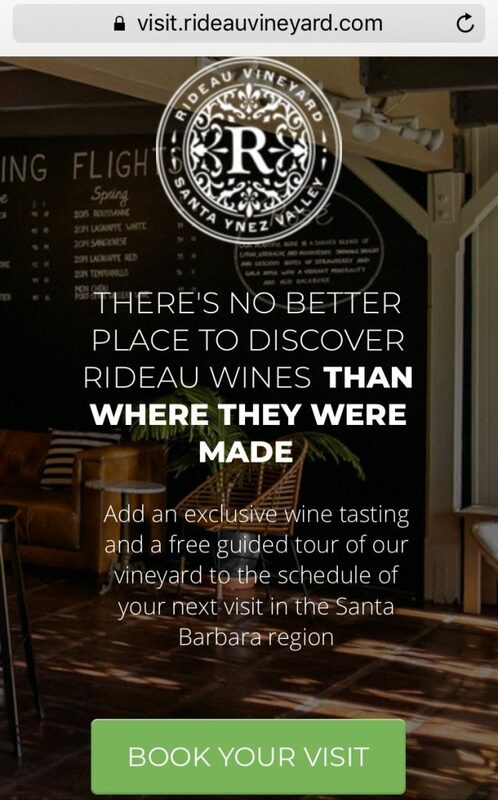 For example, a vineyard is using PPC advertising to increase on-site visits, tastings and tours. Rather than using a generic CTA like “Learn More” or “Request Information” that leaves a user hanging, they choose “Book Your Visit,” which makes the user take action now that gets the desired result of the ad campaign. Mobile landing page example 2. Mobile landing pages work with very limited space, so a simple and straightforward design is key to avoid landing page clutter that leads to confusion and mixed messaging. 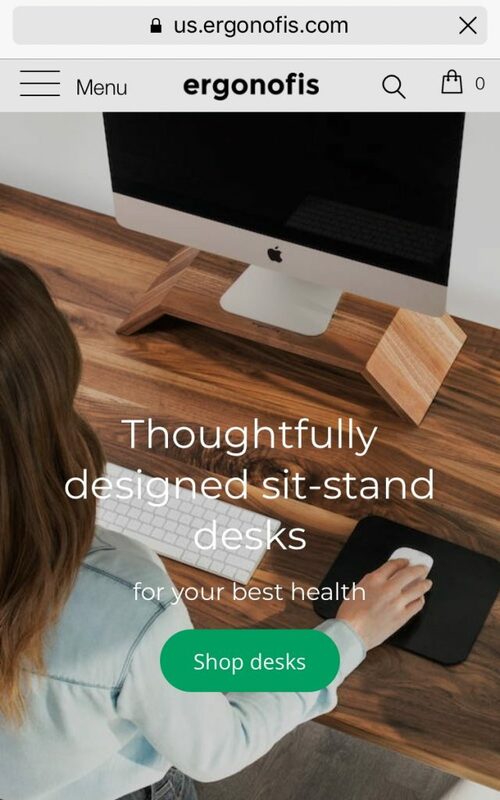 For example, a company that sells standing desks uses PPC advertising to increase sales. 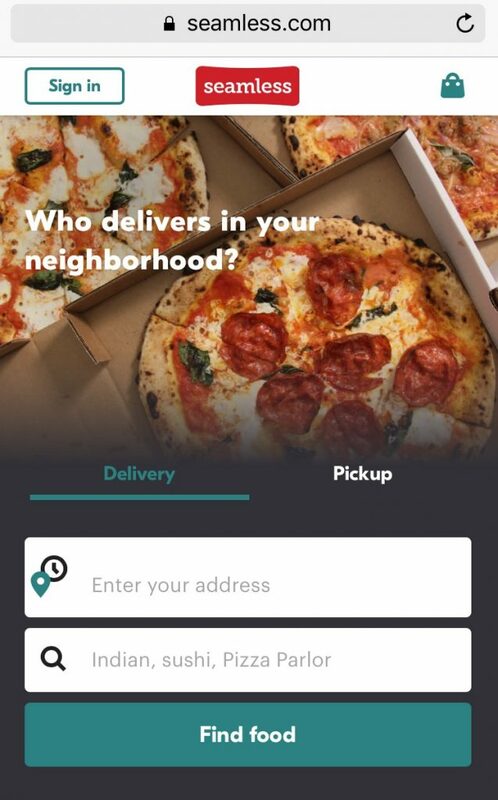 Their mobile landing page uses minimal words, backed by an image of what the user is looking for, and a CTA that displays without requiring the user to scroll down on the page. Mobile landing page example 3. Use an offer that users cannot get elsewhere to incite urgency and exclusivity. If an offer is readily available from a number of sources, users won’t feel as inclined to take the offer. Create exclusive deals for your mobile ads. For example, Vistaprint offers those who clicked on their mobile ad a 60 percent discount if they place an order. Mobile landing page example 4. Mobile ads and landing pages aren’t only to increase online sales. They can also be used to get users to come to your location physically. Many businesses use GPS-enabled landing pages that can direct users to them. Think of creative ways to get people to see you in-person. 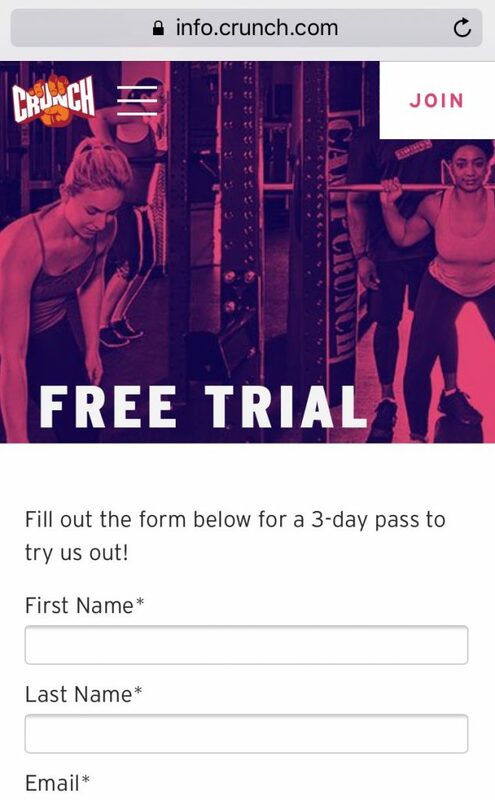 For example, a fitness center offers a free trial for those who clicked their mobile ad. This offer appeals to users interested in local fitness centers and entices them to visit. Mobile landing page example 5. What is a Good Conversion Rate for a Mobile Landing Page? The average landing page conversion rate across all industries is a mere 2.35 percent. 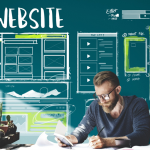 Depending on your industry, it’s safe to say that a landing page with a conversion rate of more than 5 percent is strong. How Are Mobile Landing Pages Different from Standard Landing Pages? Mobile landing pages are designed differently from standard landing pages for desktop ads for two main reasons: First, the device size is much smaller on mobile and, second, each device has a different user intent. For example, mobile landing pages are single column layout, include less copy and can use mobile-friendly CTAs like click-to-call. Where Can I Find Someone to Optimize My Mobile Landing Page? Mobile landing page optimizations aren’t for everyone, which is why many businesses choose to leave it to the experts. If you’re looking for an affordable solution to professional mobile landing page optimizations, try Fiverr. There you will find a number of experienced and highly rated freelancers available for task-based projects like mobile landing page optimizations at prices as low as $5. Another option is to use a professional PPC management company for ongoing account management. Mobile landing pages play a vital role in turning clicks to conversions as they are designed precisely for ads displaying on mobile devices. Creating landing pages specifically to meet the needs of your users, their goals and the devices they’re on will help to increase your number of conversions further and drive more sales from your existing ad spend. Even with the wealth of data available it can be difficult to know how to best optimize landing pages for conversions. For that reason, we suggest using the all-in-one conversion optimization suite by Freshmarketer, which takes the guesswork out of optimizations and helps you build better landing pages that see higher conversions without requiring marketing or web development expertise.